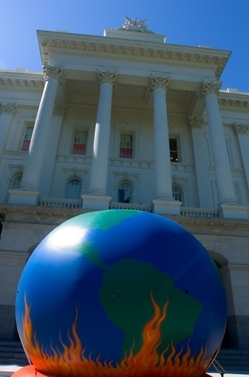 When California passed it’s land-mark Greenhouse Gas reduction laws in 2006, residents and businesses were assured that funds raised through the controversial “cap and trade” program would be invested in programs and projects that would further reduce emissions. That promise is turning out to be a lot of hot air. Yesterday, Governor Jerry Brown unveiled his budget for the 2013-2014 fiscal year that includes the first round of funds collected under the cap and trade system. In the budget, Brown “loans” the half billion in funds collected to the general fund to be paid back at some point in the unspecified future. “We disagree with the Governor’s proposal to transfer the $500 million in cap-and-trade auction revenues to the general fund and postpone needed investments in projects and programs that could achieve greenhouse gas reductions this year,” writes Stuart Cohen, the executive director of TransForm CA. Brown’s budget announcement comes on the heels of reports that carbon concentrations have crossed the 400 parts per million threshold widely recognized as a dangerous level that could drastically worsen human-caused climate change. In recent months, environmental and transportation advocacy groups were arguing over how the cap and trade funds could be spent. Debates over questions on whether highway repair should be considered a project that reduces greenhouse gas emissions seem quaint when the state refuses to actually use the funds on climate change projects. The 2013-2014 budget includes only the first phase of the cap and trade program. As it grows it will create billions of dollars in fees. Some of those fees will go to utility companies to offset rate hikes, but most will go into projects designed to reduce carbon emissions with the goal of reducing emissions to 1990 levels by 2020. Knowing the state’s history of raiding funds dedicated towards transit and other green projects to fill budget holes, Brown signed himself signed legislation in 2012 that was designed to stop yesterday’s budget trickery from happening. The “cap” in “cap and trade” sets a limit on emissions, which is lowered over time to reduce the amount of pollutants released into the atmosphere. The “trade” creates a market for carbon allowances, helping companies innovate in order to meet, or come in under, their allocated limit. The less they emit, the less they pay. Cap and trade theoretically creates an economic incentive to pollute less.